Modern digital hearing aids perform a variety of signal processing tasks aimed at improving the quality and intelligibility of the received sound signals. These tasks include frequency-dependent amplification, feedback cancellation, background noise reduction, and environmental sound classification. Among these, improving speech intelligibility in the presence of interfering sound sources remains one of the most sought-after features among hearing aid users . Hearing aids attempt to achieve this goal through beamforming using two or more microphones, and exploit the spatial diversity resulting from the different spatial positions of the desired and interfering sound sources . The distance between the microphones on a single hearing aid is typically less than 1 cm due to the small size of such devices for aesthetic reasons. This small spacing limits the gain that can be obtained from microphone array speech enhancement algorithms. Binaural beamforming, which uses signals from both the left and right hearing aids, offers greater potential due to the larger inter-microphone distances corresponding to the distance between the two ears (16–20 cm). In addition, such a scheme also provides the possibility to exploit the natural attenuation provided by the head. Depending on the location of the interfering source, the signal-to-interference ratio (SIR) can be significantly higher at one ear compared to the other, and a binaural system can exploit this aspect. A high-speed wireless link between the hearing aids worn on the left and right ears has been recently introduced . This allows binaural beamforming without the necessity of having a wired connection between the hearing aids, which is impractical again due to aesthetic reasons. The two hearing aids form a body area network, and can provide significant performance gains by collaborating with one another. 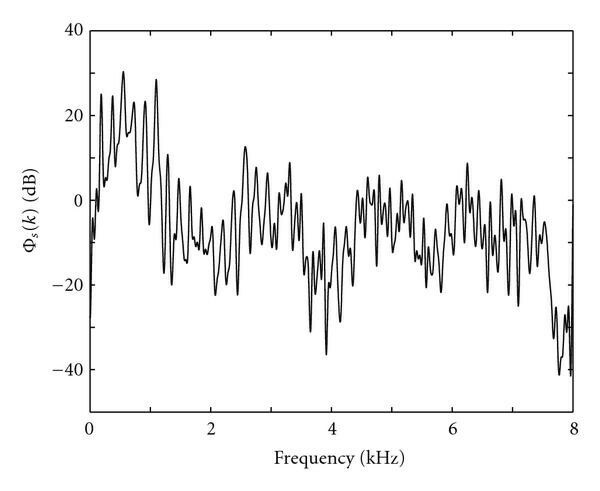 The performance of binaural noise reduction systems has been previously studied in, for example, [4–8]. However these systems implicitly assume the availability of the error-free left and right microphone signals for processing. In practice, the amount of information that can be shared between the left and right hearing aids is limited by constraints on power consumption imposed by the limited capacity of hearing aid batteries. It is known  that quantization of a signal with an additional bit causes the power dissipation in an ADC to be increased by 3 dB. Hence to conserve battery in a hearing aid, it is critical to compress with as few bits as possible before wireless transmission occurs. One in five users was reported to be dissatisfied with hearing aid battery life , and it is thus an important consideration in hearing aid design. In this paper, we study analytically the trade-off in the performance of a GSC beamformer with respect to quantization bits. Different configurations are possible for a binaural beamforming system, for instance, both hearing aids could transmit their received microphone signals to a central device where the beamforming is performed, and the result could then be transmitted back to the hearing aids. Alternatively, the hearing aids could exchange their signals and beamforming may be performed on each hearing aid. In this paper, to analyze the effect of quantization errors on beamforming, without loss of generality we assume that each hearing aid has one microphone and that the right hearing aid quantizes and transmits its signal to the left hearing aid, where the two signals are combined using a beamformer. This paper is an extension of our earlier work , incorporates the effect of head shadow and presents a more detailed experimental analysis. If the power spectral density (PSD) of the desired source is known a priori, the two-microphone Wiener filter provides the optimal (in the mean squared error sense) estimate of the desired source. The effect of quantization errors in such a framework has been investigated in . However, in practice the PSD is unknown. In this paper, we consider a particular beamformer, the generalized sidelobe canceller (GSC) , which does not require prior knowledge of the source PSD. The GSC requires knowledge of the location of the desired source, which is available since the desired source is commonly assumed to be located at (in front of the microphone array) in hearing aid applications . The motivation behind this assumption is that in most real-life situations, for instance, a conversation, the user is facing the desired sound source. In a free field, the two-microphone GSC can cancel out an interfering sound source without distorting the desired signal, which is a desirable feature in hearing aids. Thus, the GSC is well suited for hearing aid applications, and we study the impact of quantization errors on the GSC in this paper. The performance of the GSC may be affected by other sources of error such as microphone mismatch, errors in the assumed model (the desired source may not be located exactly at , reverberation, and so forth. Variations of the GSC that are robust to such imperfections are discussed in [14–16]. In this paper, we exclude such errors from our analysis to isolate the effect of the errors introduced by quantization on the performance of the GSC. The remainder of this paper is organized as follows. We introduce the signal model and the head shadow model we use in Section 2. The binaural GSC and its behavior in the presence of quantization errors are discussed in Section 3. The performance of the GSC at different bit rates is analyzed in Section 4. Finally, concluding remarks and suggestions for future work are presented in Section 5.
where and are the transfer functions between the microphone on the left hearing aid and the desired and interfering sources, respectively, and corresponds to uncorrelated (e.g., sensor) noise with . The transfer functions and include the effect of head shadow. For each , we model , , and as memoryless zero mean complex Gaussian sources, with variances , , and , respectively. Their real and imaginary parts are assumed to be independent with variances , , and , respectively. where the relevant terms are defined analogously to the left ear. We assume that , and that , , and are pairwise independent. where is the Legendre polynomial of degree , is the spherical Hankel function of order , and is the derivative of with respect to its argument. The head shadow model. The left and right hearing aids each have one microphone and are located at on the surface of a sphere of radius . We consider the case where the quantities , , , and are all unknown. As is typical in hearing aid applications , we assume the desired source to be located in front of the user, that is, . 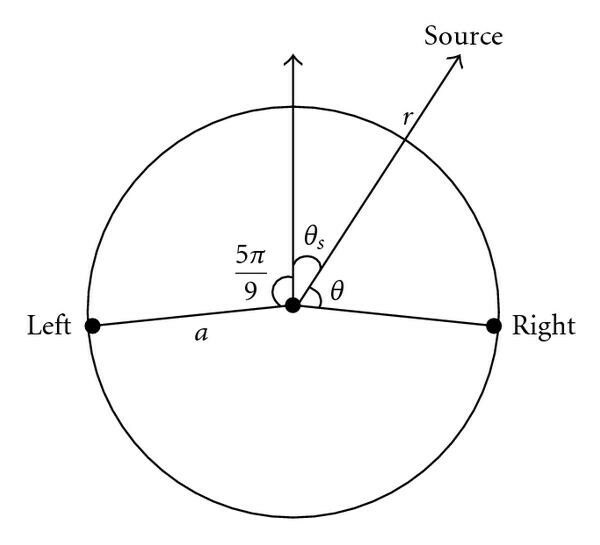 Thus, due to symmetry, the HRTFs between the desired source and the left and right microphones are equal (this is valid in anechoic environments, and only approximately satisfied in reverberant rooms). Let . The GSC structure  depicted in Figure 2 can then be applied in this situation. The fixed beamformer simply averages its two inputs as the desired source component is identical in the two signals. The blocking matrix subtracts the input signals resulting in a reference signal that is devoid of the desired signal, and forms the input to the adaptive interference canceller. Frequency-domain implementation of the GSC. so that the distortion is obtained as . The signals and form the two inputs to the GSC. If the PSDs , and are known, more efficient quantization schemes may be designed, for example, one could first estimate the desired signal (using a Wiener filter) from the noisy observation at the right ear, and then quantize the estimate as in . However, as the PSDs are unknown in our model, we quantize the noisy observation itself. We first look at the case when there is no quantization and the left hearing aid receives an error-free description of . This corresponds to an upper bound in our performance analysis. We then consider the case when is quantized at a rate bits per sample. The GSC has three basic building blocks. The first is a fixed beamformer that is steered towards the direction of the desired source. The second is a blocking matrix that produces a so-called noise reference signal that is devoid of the desired source signal. Finally, the third is an adaptive interference canceller that uses the reference signal generated by the blocking matrix to cancel out the interference present in the beamformer output. The adaptive filter is updated such that the expected energy of the residual given by is minimized, for example, using the normalized least mean square algorithm [19, Chapter 9]. Since does not contain the desired signal, minimizing corresponds to minimizing the energy of the interferer in the residual. Note that none of the above steps require knowledge of the PSD of the desired or interfering sources. SINR after processing for input SIR 0 dB, input SNR 30 dB, and interferer located at 40 ° . Solid curves correspond to binaural GSC at the specied bit rates (bits per sample), and the dotted curve corresponds to the monaural case. 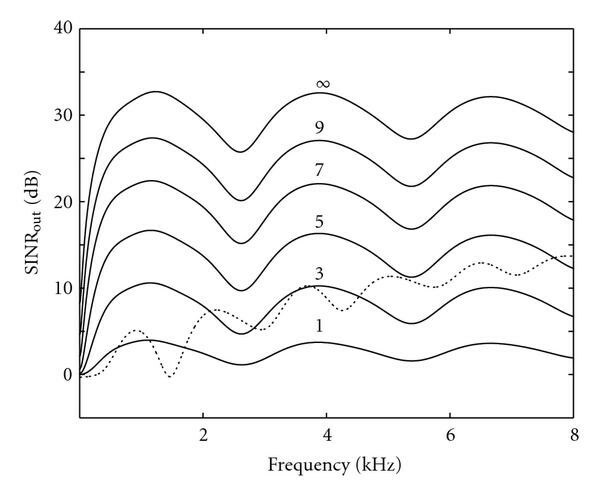 It can be seen from Figure 3 that at a rate of 5 bits per sample, the binaural system outperforms the monaural system. Note that by bits per sample we mean bits allocated to each sample per frequency bin. Figure 4 shows the performance of the binaural GSC without considering the effect of head shadow, that is, assuming that the microphones are mounted in free space. In this case, the transfer functions , , and correspond to the appropriate relative delays. The sharp nulls in Figure 4 correspond to those frequencies where it is impossible to distinguish between the locations of the desired and interfering sources due to spatial aliasing, and thus the GSC does not provide any SINR improvement. 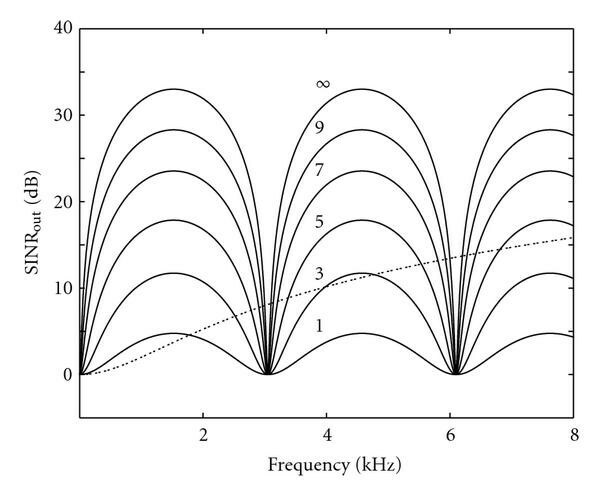 It is interesting to note that the differences introduced by head shadow helps in this respect, as indicated by the better performance at these frequencies in Figure 3. SINR after processing for input SIR 0 dB, input SNR 30 dB, and interferer located at 40 ° , ignoring the effect of head shadow (microphone array mounted in free space). Solid curves correspond to binaural GSC at the specied bit rates (bits per sample), and the dotted curve corresponds to the monaural case. The performance of the monaural system varies significantly based on the interferer location. When the desired source and interferer are located close together as in the case of Figure 3, the small end fire microphone array cannot perform well due to the broad main lobe of the beamformer. When the interferer is located in the rear half plane, the monaural system offers good performance, especially at high frequencies. Figure 5 plots the output SINR under the same conditions as in Figure 3 except that the interferer is now located at and thus there is a larger separation between the desired (located at and interfering sources. 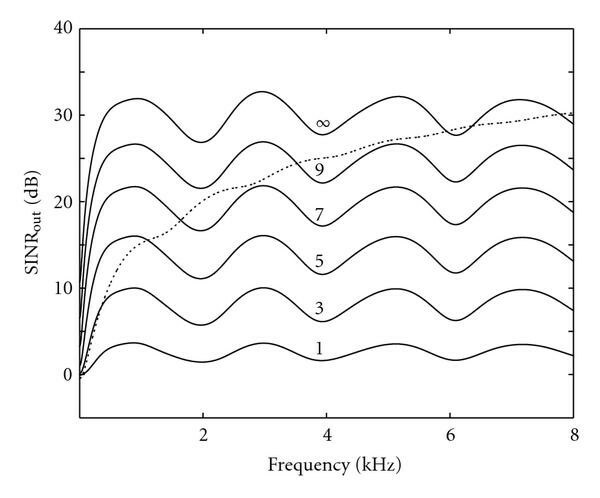 The monaural system (dotted line) performs better than when the interferer was located at In this case, the binaural system needs to operate at a significantly higher bit rate to outperform the monaural system, and the benefits are mainly in the low-frequency range up to 4 kHz. SINR after processing for input SIR 0 dB, input SNR 30 dB, and interferer located at 120 ° . Solid curves correspond to binaural GSC at the specied bit rates (bits per sample), and the dotted curve corresponds to the monaural case. The largest improvements are obtained at low SIRs and high SNRs, where the adaptive interference canceller is able to perform well as the level of the interferer is high compared to the uncorrelated noise in the reference signal . At high SIR and low SNR values, the improvement reduces to the 3 dB gain resulting from the reduction of the uncorrelated noise due to the doubling of microphones. For low SNR values, the improvement due to the interference canceller is limited across the entire range of SIR values. However, as the SNR increases, the interference canceller provides a significant improvement in performance as can be seen in the right rear part of Figures 6 and 7. At high SNR and SIR values, a low bit rate (e.g., 4 bits per sample) results in degradation of performance as the loss due to quantization more than offsets the gain due to beamforming. At low bit rates, the reference signal , which forms the input to the adaptive interference canceller, is no longer devoid of the desired signal. This is one of the reasons for the poor performance of the binaural GSC at low bit rates as the adaptive filter cancels some of the desired signal. In fact, as observed in , in the absence of uncorrelated noise, the SIR at the output of the adaptive interference canceller is the negative (on a log scale) of the SIR in . 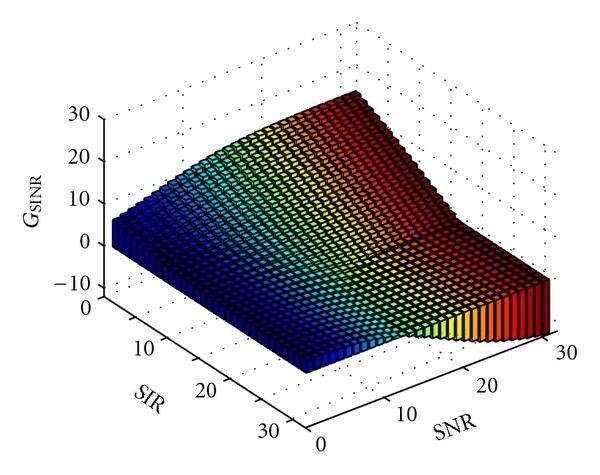 At high input SIRs and SNRs, even a small amount of desired signal leakage results in a high SIR in , which in turn results in a low SIR at the output as seen in Figure 6. One approach to avoid cancellation of the desired signal is to adapt the filter only when the desired signal is not active . The detections may be performed, for example, using the method of . 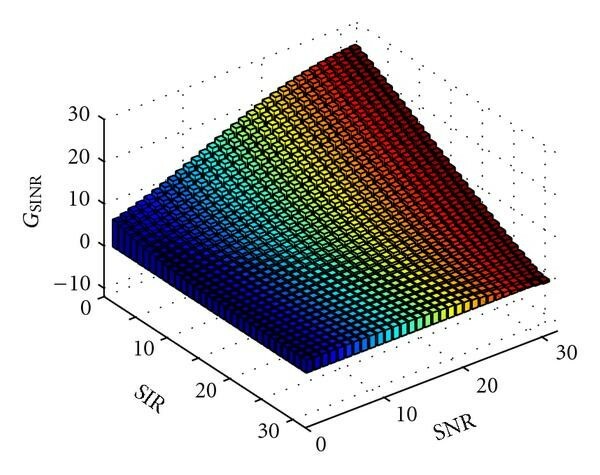 Improvement in SINR after processing at 4 bits per sample for interferer located at 40 ° , and for different values of SIR and SNR. Improvement in SINR after processing at 8 bits per sample for interferer located at 40 ° , and for different values of SIR and SNR. A uniform rate allocation across the different frequency bins cannot exploit the dependence of the output SINR on frequency as seen in Figures 3 and 5, and thus a nonuniform scheme is necessary. The distortion function does not lend itself to a closed-form solution for the rate allocation, and suboptimal approaches such as a greedy allocation algorithm need to be employed. In a greedy rate allocation scheme, at each iteration, one bit is allocated to the band where the additional bit results in the largest decrease in distortion. The iterations terminate when all the available bits are exhausted. Figure 8 shows the output SINR (averaged across all frequencies) at different bit rates for both uniform and greedy rate allocation. Here, the desired and interfering signals were assumed to be speech. The signals, sampled at 16 kHz, were processed in blocks of samples, and the results were averaged over all blocks. Figure 9 shows the PSD of a segment of the signal. It can be seen from Figure 8 that the greedy allocation (dotted) scheme results in better performance compared to the uniform rate allocation (solid) scheme. However, we note that the greedy algorithm requires knowledge of the PSDs and , and the location of the interferer. Improvement in SINR after processing averaged across all frequencies at different bit rates (kbps) for uniform rate allocation (solid) and greedy rate allocation (dotted). A wireless data link between the left and right hearing aids enables binaural beamforming. Such a binaural system with one microphone on each hearing aid offers improved noise reduction compared to a two-microphone monaural hearing aid system. The performance gain arises from the larger microphone spacing and the ability to exploit the head shadow effect. The binaural benefit (improvement compared to the monaural solution) is largest when an interfering source is located close to the desired source, for instance, in the front half plane. For interferers located in the rear half plane, the binaural benefit is restricted to the low-frequency region where the monaural system has poor spatial resolution. Unlike the monaural solution, the binaural GSC is able to provide a uniform performance improvement regardless of whether the interferer is in the front or rear half plane. Wireless transmission is power intensive and battery life is an important factor in hearing aids. Exchange of microphone signals at low bit rates is thus of interest to conserve battery. In this paper, the performance of the binaural system has been studied as a function of the communication bit rate. The generalized sidelobe canceller (GSC) has been considered in this paper as it requires neither knowledge of the source PSDs nor of the location of the interfering sources. Both the monaural and binaural systems perform best when the level of uncorrelated noise is low, that is, at high SNRs, when the adaptive interference canceller is able to fully exploit the availability of the second signal. At an SNR of 30 dB and an SIR of 0 dB, the binaural system offers significant gains (15 dB SINR improvement for interferer at even at a low bit rate of 4 bits per sample. 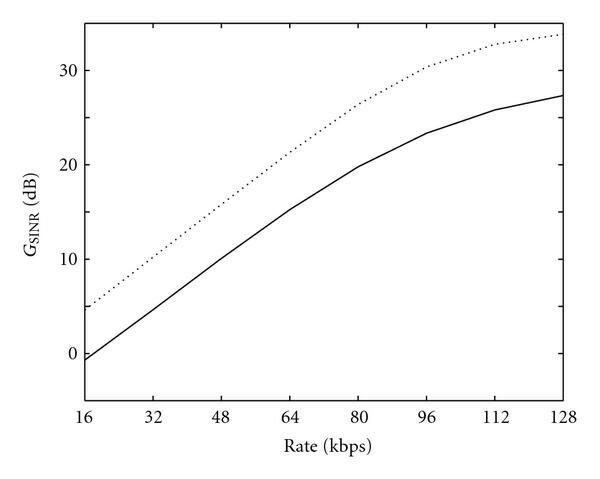 At higher input SIRs, a higher bit-rate is required to achieve a similar gain. In practice, the total number of available bits needs to be optimally allocated to different frequency bands. An optimal allocation would be nonuniform across the different bands. Such an allocation however requires knowledge of the source PSD and the location of the interferer. Alternatively, a suboptimal but practically realizable uniform rate allocation may be employed. It has been seen that such a uniform rate allocation results in a performance degradation of around 5 dB in terms of SINR compared to a nonuniform allocation obtained using a greedy optimization approach. The main goal of this paper has been to investigate the effect of quantization errors on the binaural GSC. Several extensions to the basic theme can be followed. Topics for future work include studying the effect of reverberation and ambient diffuse noise on the performance of the beamformer. Binaural localization cues such as interaural time and level differences have been shown to contribute towards speech intelligibility. Future work could analyze the effect of quantization errors on these binaural cues.